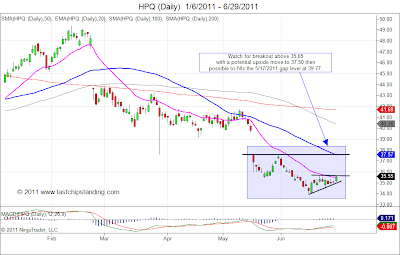 - HPQ gap up and ran off. Skip this setup and wait for next setup. 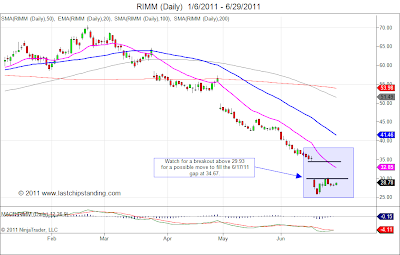 - RIMM stayed home and made little progress toward breakout level. Continue watch. - MRVL moved above breakout level 14.54 and initiated a swing long. 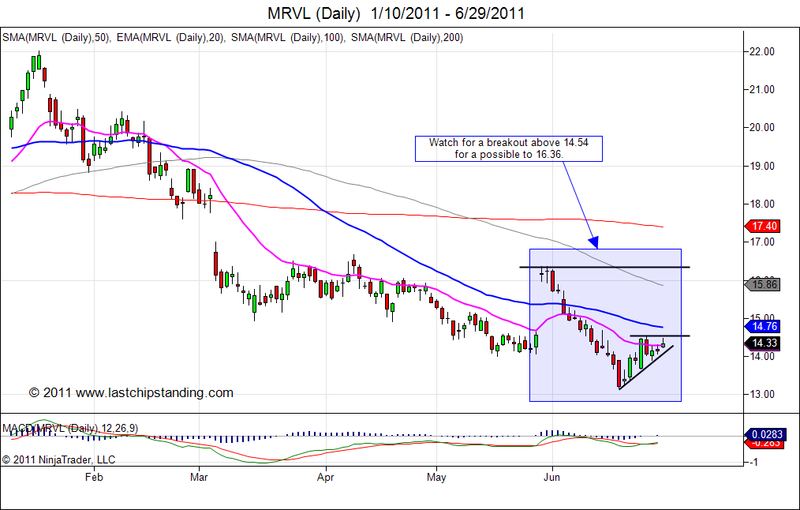 A swing long position was initiated as the price of MRVL moved above 14.54. 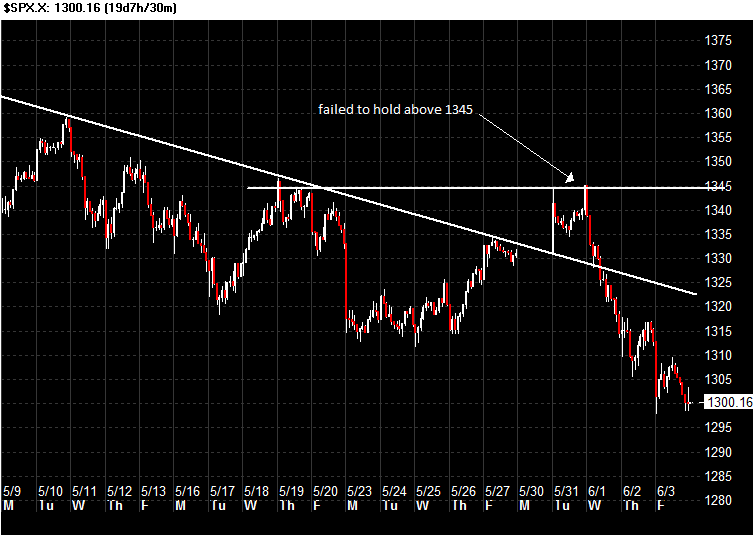 Keeping this trade tight by setting the stop to breakeven level after the intraday price has reached 14.78. This trade is now a risk free trade. 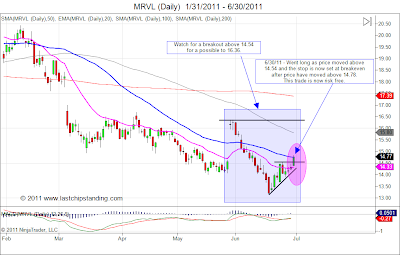 Here is the daily price chart showing today's move. 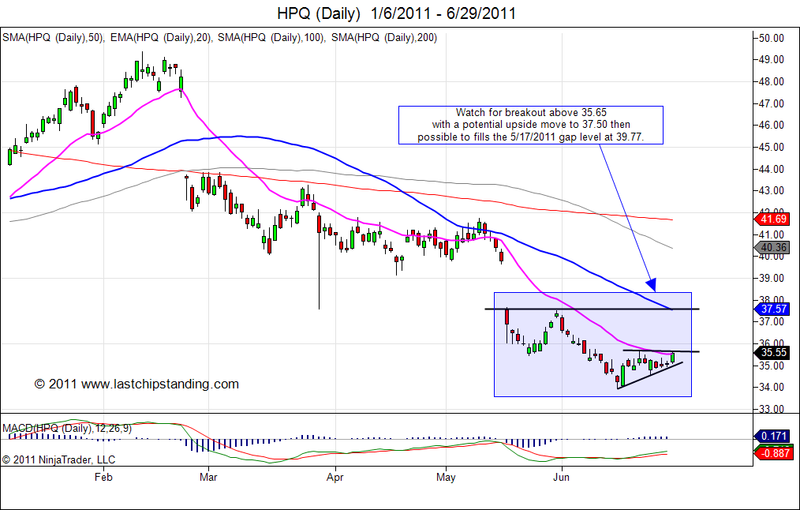 HPQ opened with a gap up. There was news on possible breaking up the company by PE buying pieces of the company. 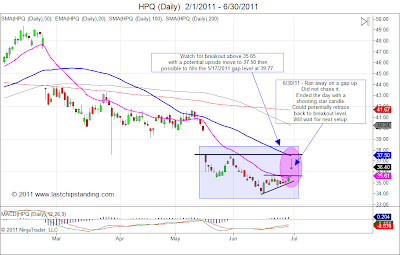 Today's price action formed a shooting star candle which can result in a reversal move. Will pass on this setup and wait for the next setup. 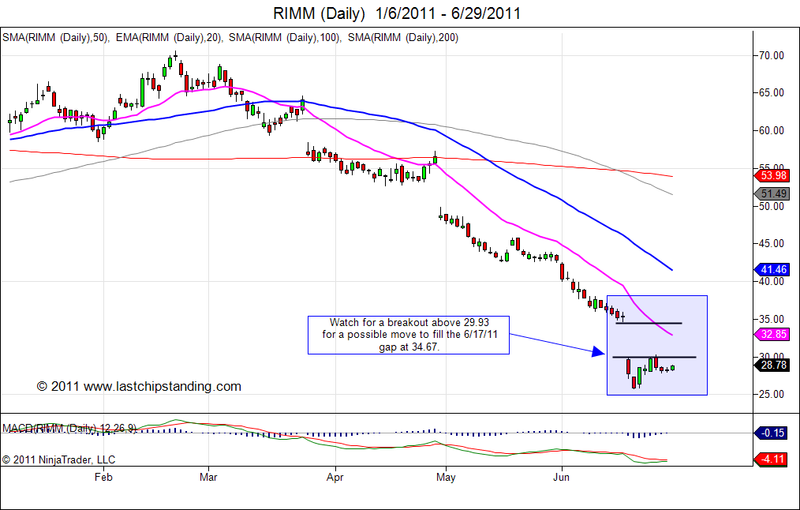 Here are three stocks that appear to be coming out of the dog house: MRVL, HPQ, and RIMM. 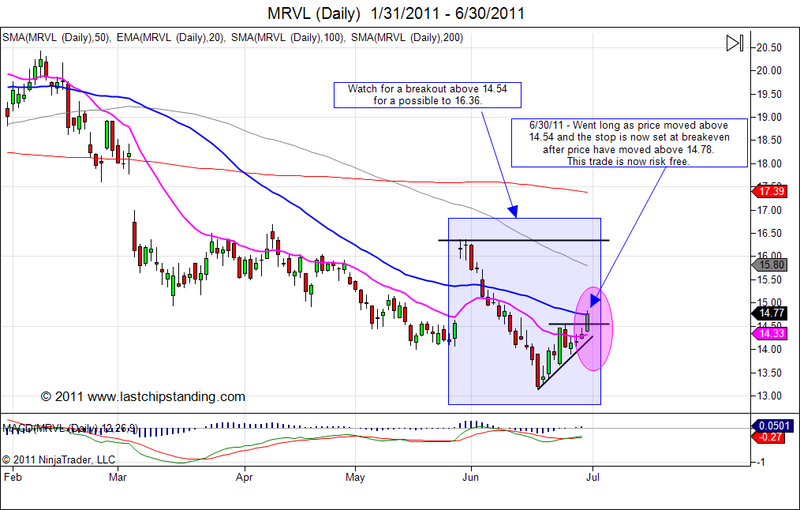 The following charts highlight potential breakout and potential upside level. 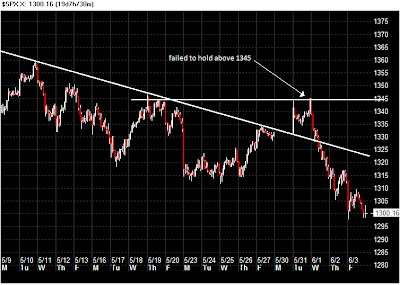 Silver appears to be coming down to test the $33 an ounce level once again. 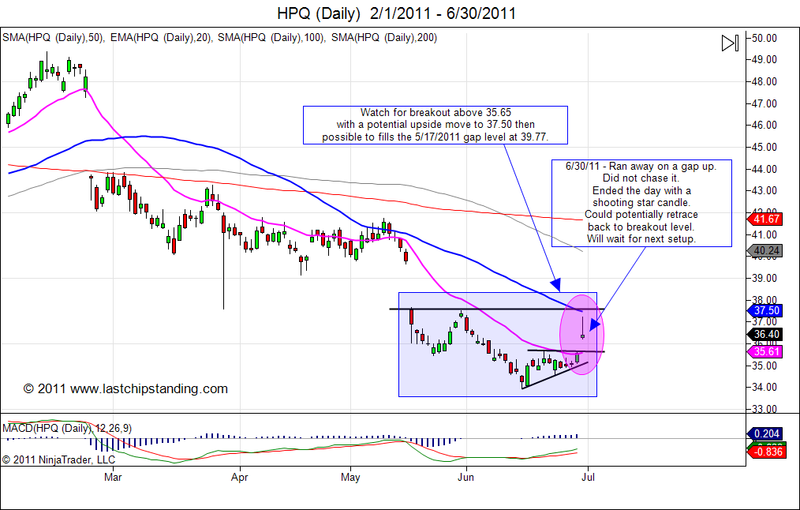 If it breaks below this level, it can very well be headed down to the $26 level this time. Recently, the phrase “double dip” started to be heard once again as numerous economic reports showing signs the US economy is not recovering as expected. Even with the QE2 (time will tell if this is an ill conceived experiment), it did not help reduce the US unemployment rate or get the US GDP to grow at a level that will take the US economy out of the recession. Worst yet, $600B spent and no significant amount of new jobs were created. Is the US economy moving toward a double dip recession? The answer depends on who you are listening to. In one camp, the talking heads blame the Japan earthquake, the tornados, and the rising oil prices for causing this temporary slowdown. And the opposite side is citing the massive liquidity the FED injected into the system via QE2 did nothing to promote business expansion, instead, it only fueled rising asset prices (stocks in particular) and rising commodities prices including the price for crude oil. So who does the market believe? 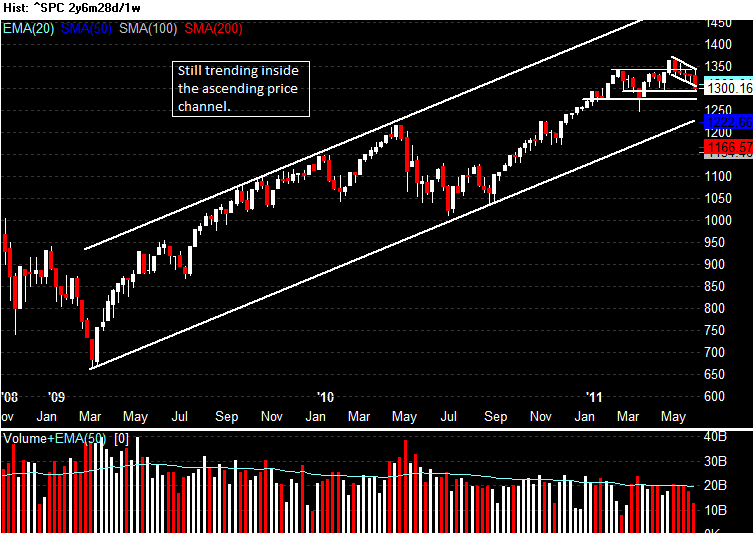 Looking at the Dow Jones Industrials index, it appears it is heading down in anticipation of a slowing economy. 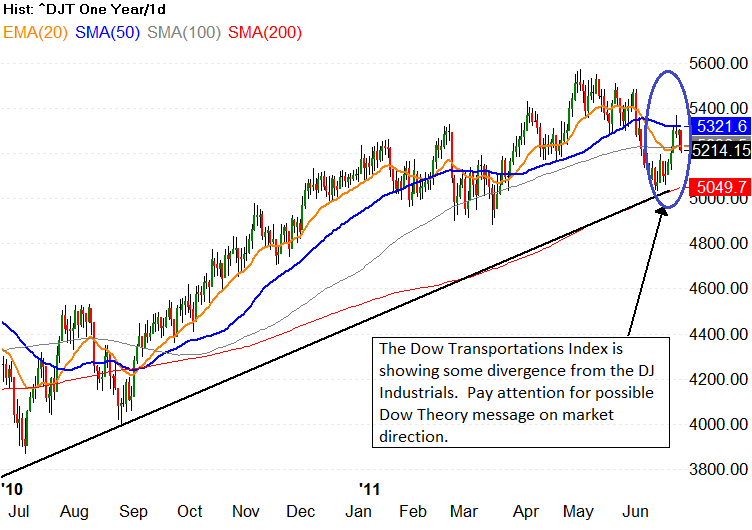 But the Dow Jones Transportation index is showing some hesitation in agreeing with the DJI. 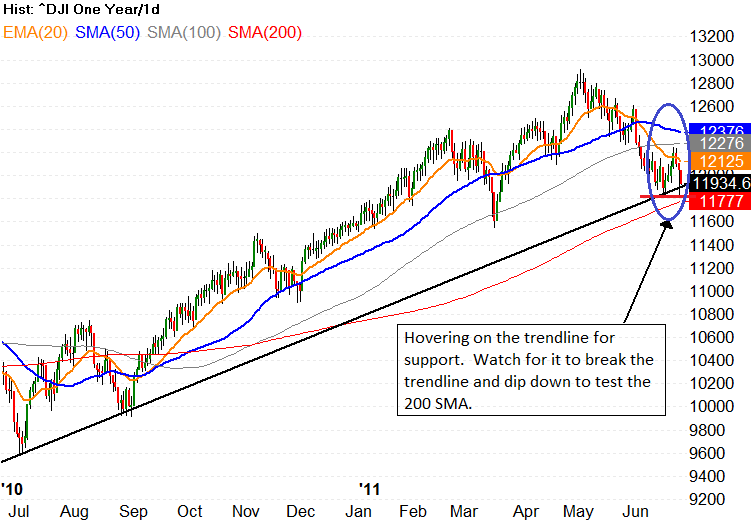 The DJI is nearing a breakdown to test its 200 SMA, while the DJT is above its supporting trendline and the 200 SMA, and it could be setting up to move back to the May, 2011 level. Some might point out the recent strength of the DJT could be due to falling crude oil prices. 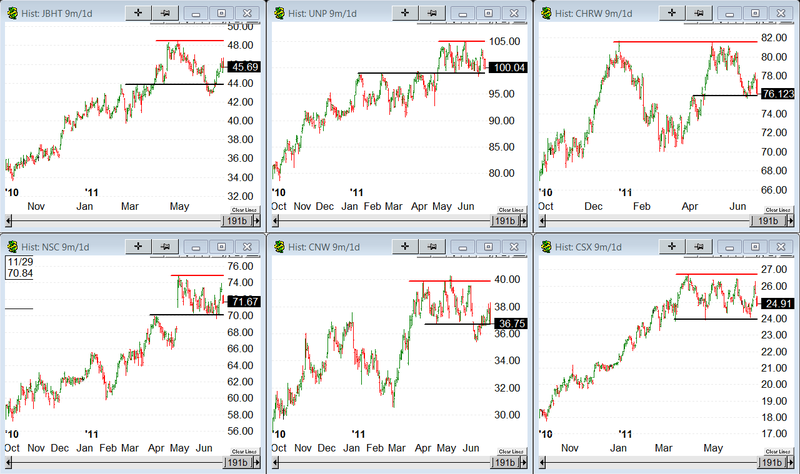 To gauge the future strength of the DJT is due to the improving manufacturing sector and not primarily due to falling crude oil prices, keep an eye on some of the rails and shipping stocks. 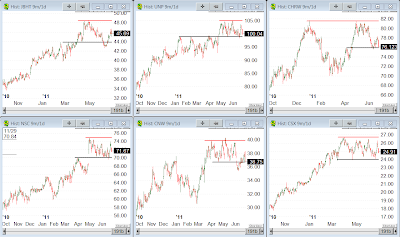 Watching how some of these transportation stocks perform in the coming weeks will give us a better picture on whether a double dip is real or the recent slowdown in the US economy is temporary. 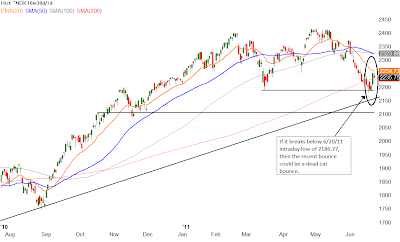 If the price of these stocks breaks below the support level indicated by the line drawn in black, then double dip could be in the card. 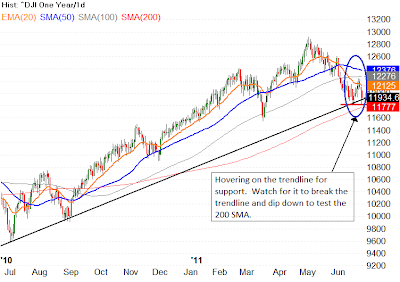 But if the price of these stocks breaks above their recent high, indicated by the red line, then this slowdown could be temporary. 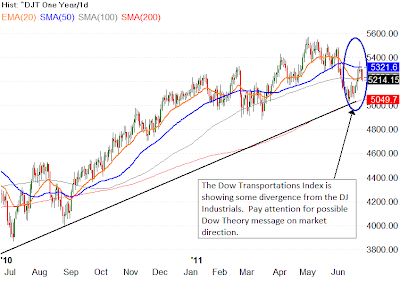 While the talking heads debate on the double dip or no double dip, I will be keeping an eye on these transportation stocks and pay attention to the market when the Dow Theory speaks. 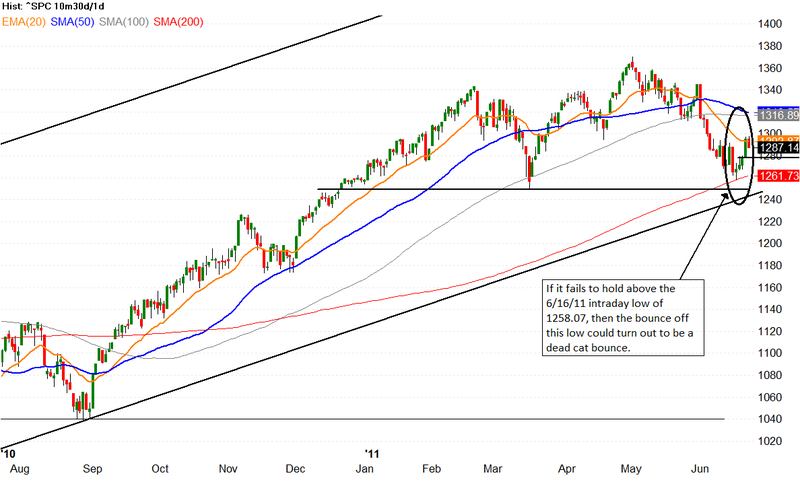 Is the recent market bounce a dead cat bounce? After the SP500 being up for four consecutive days, it experienced a down day with a loss of 0.65%, or 8.38 points. The Nasdaq 100 and the Dow Jones Industrial incurred similar losses. 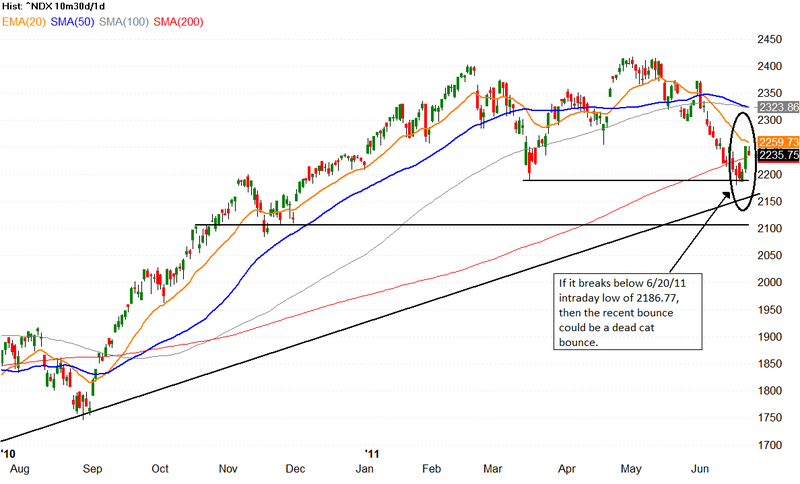 Unless these market indices can hold above their recent pivot low, then this brief up trend could turn out to be a dead cat bounce. 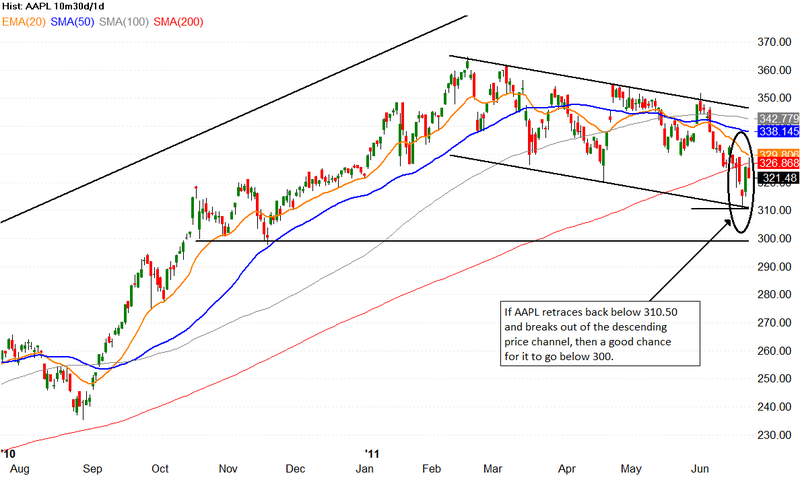 When a market leader such as AAPL starts to break down, it doesn’t instill confidence for the bulls to step up. If AAPL break down from the descending price channel and move below 310, a price below 300 could be very probable. Until the market has shown sign of a reversal, such as a new higher high/higher low, I will either move to the sideline or look for short setups. 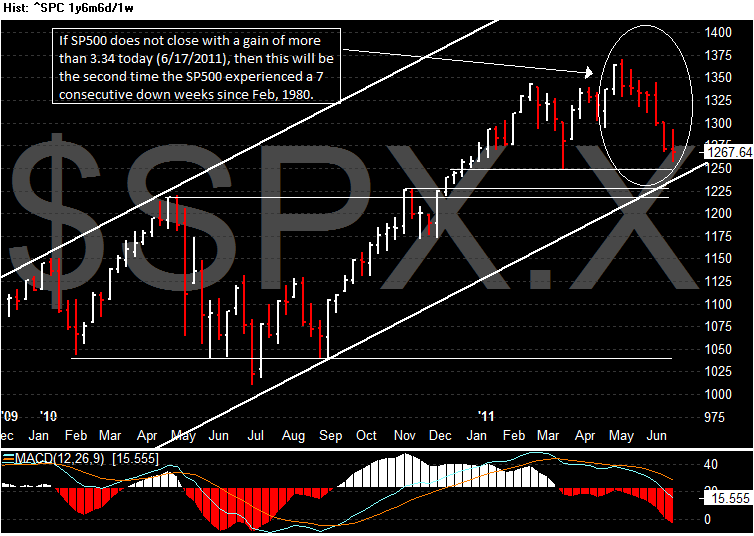 Unthinkable to see the SP500 experiencing a seven consecutive down weeks? Take a look at this chart. 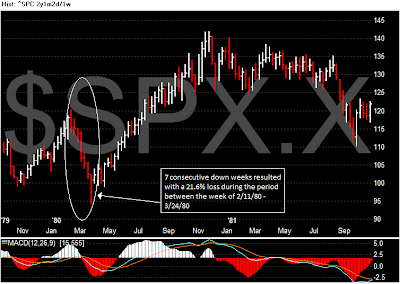 The last time SP500 experienced a seven weeks losing streak was in 2/11/1980. 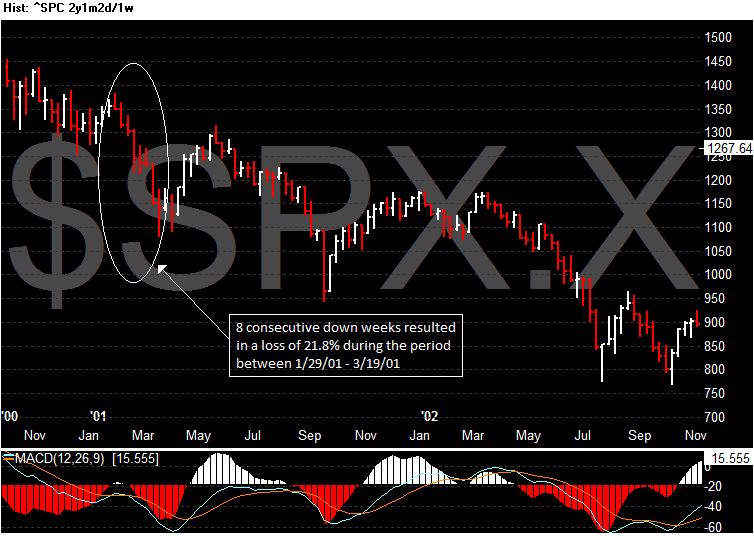 During that span of seven down weeks, the SP500 had a 21.6% loss. 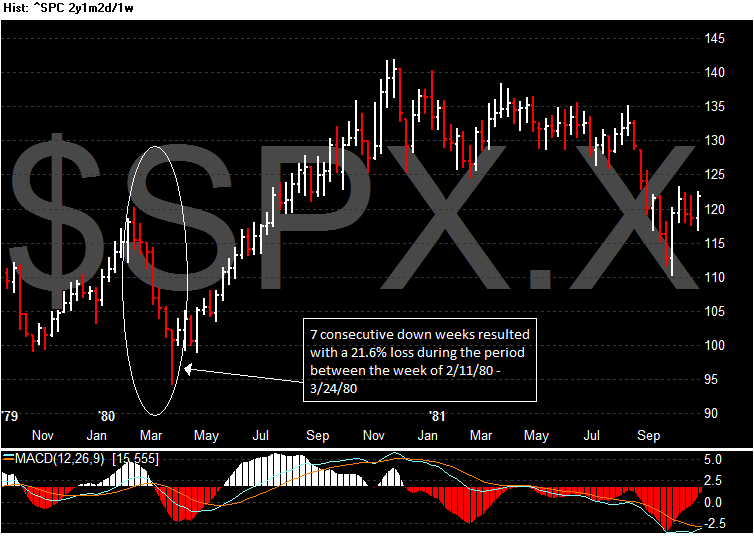 And if you think seven consecutive weeks is bad enough, take a look at this chart showing a eight weeks consecutive losses for the SP500. This eight consecutive weeks of losses occurred in 1/29/2001 (oh how soon we forget...the dot com bust). This losing streak also incurred a 21.8% loss. 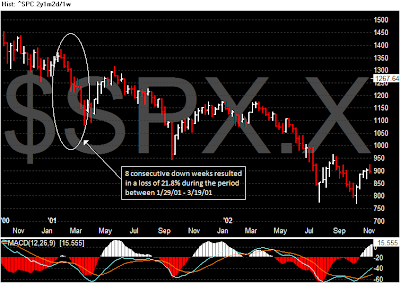 The current seven consecutive weeks of losses (pending a less than 3.34 points gain on 6/17/2011) only incurred approximately 8% of losses at the close of 6/16/2011. 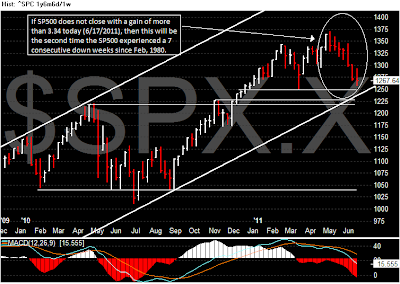 If this losing streak incurs the same percentage of losses as previous losing streaks, the SP500 will be near 1075. 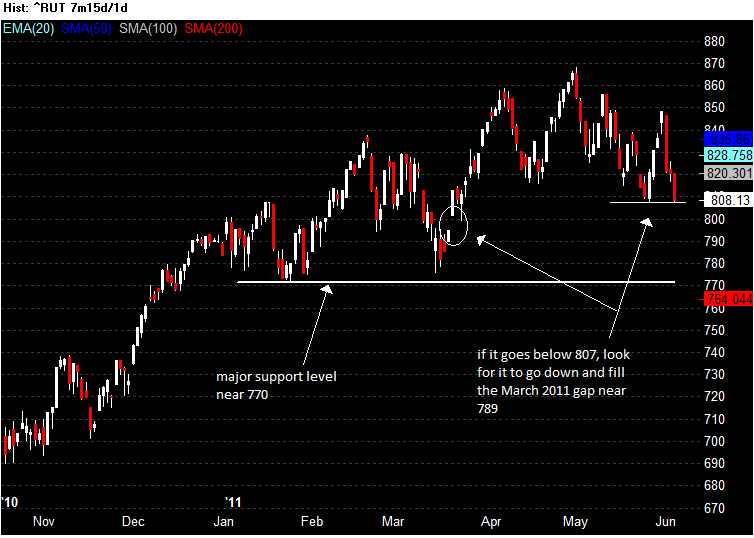 So keep an eye on the 1050 support level if this market get ugly. 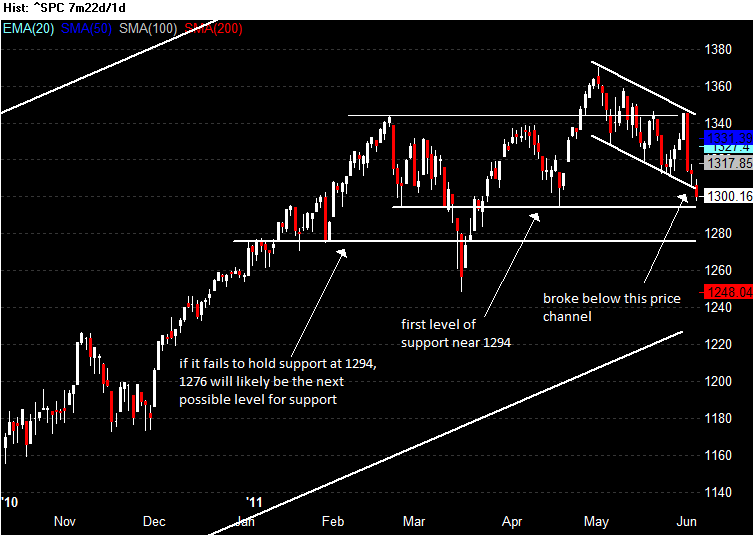 Looking at the latest SP500 daily price chart and the level near 1250 stick out as a potential support. Many market participants will be looking for a bounce when it gets near the 1250, but beware of the obvious. The market rarely do what the masses expect it to do. 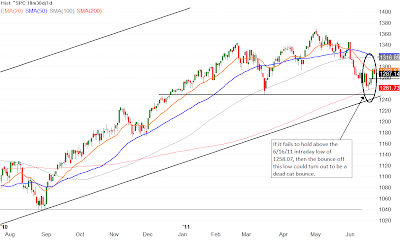 Click on the following chart for the SP500 and see where it might find support if it fails to bounce when it reaches 1250. It's testing time once again for the market. 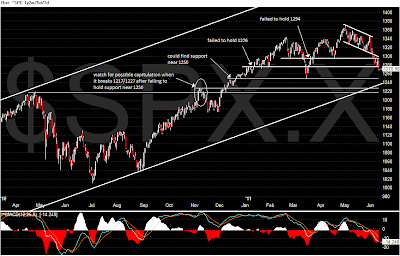 After the SP500 failed to hold above the 1345 level, it reversed and broke below the descending price channel and facing a test for support near 1294. 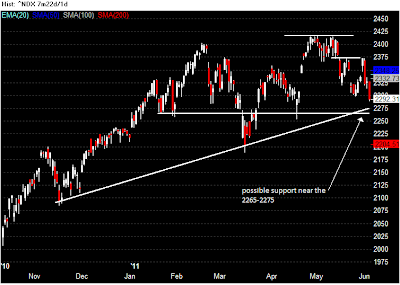 If it fails to find support at this level, then the next likely level for support will be near 1276. 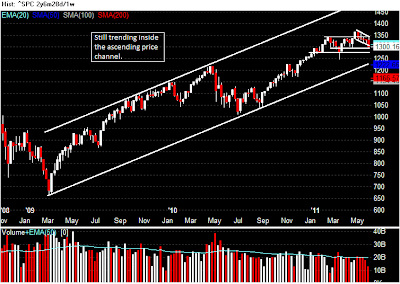 Until it breaks below 1240-1250, it still confine inside the long term ascending price channel. 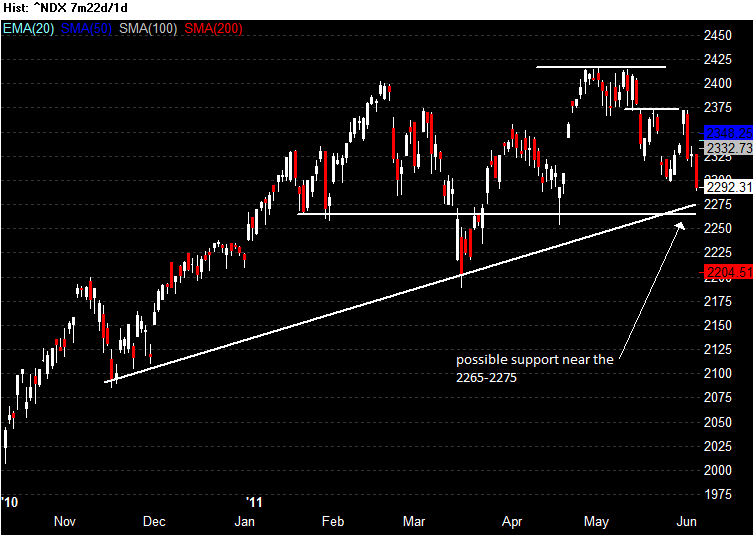 The Nasdaq 100 is also facing a test for support near the 2265-2275 region after it has made an upward move to fill the recent down gap and failed to move above the 2375 level. The Russell 2000 made a higher high toward the 850 level only to find itself reverse back down to recent pivot low near the 807 level. If it fails to hold above the 807 level, then look for it to go down to fill the March down gap and to 770 for possible support. One of my trading style is to play for the breakout, which is different than the style of trading the breakout. 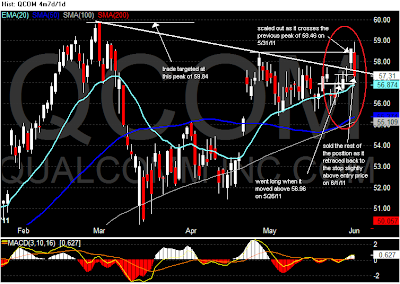 For this trade, QCOM has been consolidating under a declining trendline of a wedge (lower trendline omitted). 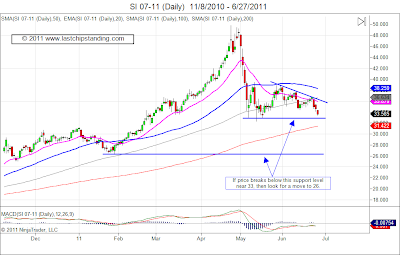 On 5/26/11, a long position was entered after it has bounced off the 20 EMA and moved above the 56.96 level with the initial stop loss level set beneath the 20 EMA. The first profit target is the last pivot off the trendline at 58.46, and the objective target is the high near the beginning of March, 2011 at 59.84. 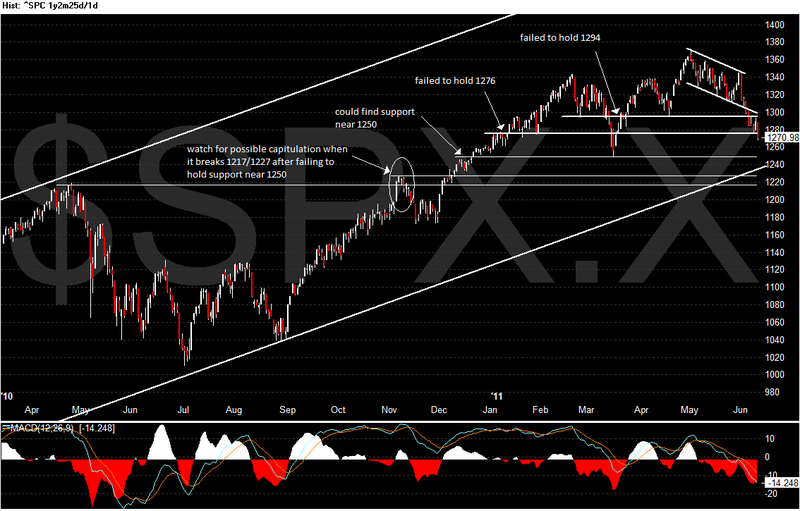 These trading levels will provide the 2:1 R/R. When the market reopen after the long Memorial Day holiday, QCOM broke above the trendline and the position was scaled out as the price crosses the first profit target level of 58.46. After reaching the first profit target, the stop level is moved slightly above the entry price level to prevent a profitable trade turned into a losing trade, and also to lock it additional profit. Today, June 1, 2011, market open in a slight negative tone. When the ADP and the ISM numbers came out that fell short of expectations, the market sold off and QCOM was no exception. As it tried to hold above the stop level throughout the session, it finally gave in on late afternoon and the stop was hit and the position was closed out.